Presented to you is a 11 song (47+ minutes) 2017 solo that is mixed, mastered, produced, and composed (with exception to trk 7 ‘Red and Orange’ by Jan Hammer, and trk 8 ‘Faces in Reflection’ by George Duke) by masterful guitarist Johannes Luley. With a fairly long career beginning with the electronic synth-pop outfit Few Boys (they only released a single ‘Secret Times’ 1985) he quickly made his way to a far more progressive rock world with two bands (Moth Vellum and Perfect Beings). He also has a previous solo ‘Tales From Sheepfather’s Grove’, but all former projects are different than his newest adventure ‘Qitara’. Led by Alan Charles, this is a double CD that is the result of the debut release of the band not being able to properly complete their intended project from 1992. The composing of material actually began in 1987. Remakes of songs from that single disc version, with additions for the two disc set, brings Existence to the most accomplished and refined they have ever sounded. While in the progressive genre, it has a strong traditional folk presence at the beginning, with plenty of violin and rock energy. 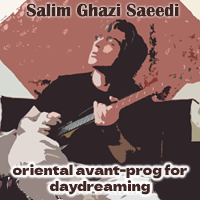 It is what I would classify as progressive folk rock, with fusion of theatre, ballad rock and even classical. The recording is a concept work and the vocals/lyrics tell a story throughout the compositions. The two sides are divided into two subtitles, CD 1: Fragile Whisperings Of Innocence (which has 7 songs) and CD 2: Silent Screams In Violence (which has 6 songs). This is the latest release from Jens Lueck featuring his partner Isgaard on vocals, Jan Petersen – Electric Guitars, Ingo Salzmann – Electric Guitars, Dieter Koch – Acoustic Guitars, additional Electric Guitars, Volker Kuinke – Recorders, Katja Flintsch – Violine, Viola, Annika Stolze – Cello also with John Turner (voice on ‘The Call’), Kai Ritter – voice, Ekiss Giloc – bass, and everything else by Jens Lueck – drums, keyboards, bass, programing, vocals, all compositions, (except main theme melody line for the character of the female protagonist, written by his daughter Marie-Jean Lueck), arrangements, production, recording, mix, and mastering – whew! Owner and manager of the terrific British pop music indy label Pink Hedgehog Records, multi-talented musician Simon Felton releases his 5th solo ‘Topsy Turvy’. As well as doing wonderful solos, Simon is also founder/frontman singer and bass player for Garfield’s Birthday. On this 2017 recording, which is a completion to his ‘therapeutic/confessional collection’, he writes and executes his finest material ever. The first track ‘The Ghost of Christmas Past’, grabs your heart and ears instantly. A mellow semi haunting pop gem, which is followed by ‘Lost and Found’ (trk 2), that reminds me of Peter Lacey’s (another Pink Hedgehog label diamond) jolly sunshine pop, fully adorned with contrast between Beach Boys/Stackridge and a bit of humor. ‘Out of Time’ (trk 3) takes a turn to a heavyheartedness that could be compared to a Korgis hit. Just beautiful. With the fourth Protocol release, Simon takes a world tour on nine compositions totaling just under an hour. He wrote and produced all of the pieces, many sounding like they could be a lost Allan Holdsworth release. Bringing us a four piece power house, band members are Ernest Tibbs (bass), Greg Howe (guitars), Dennis Hamm (keys), and of course the ever so talented Simon Phillips (drums/percussion). A prime all instrumental (with exception of mnemonic syllable of tabla) release from multi talented Al Swainger (all compositions, photography, artwork, sleeve design, bass, keyboards, voice, drum programming and production). If his name looks familiar, he has been a long time free lance jazz musician going from commercial, now to a much more expanded and sometimes experimental fusion of sorts. He has also been on previous recordings including Snow Giants ‘Un’ (05Ric, & Mike Outram) and Grice ‘Alexandrine’ to list a couple. He also has former Pointless Beauty releases you may very well want to check out. A much awaited third release (2 studio, 1 live DVD) by the terrific band Lifesigns. From the ultra melodic and solid as a rock idyllic mix of soft, arena, progressive pop and rock, this group has captured thousands of music fans so much so, that in less than 48 hours, they obtained their financial goal on Pledge Music to make this new recording independently. With that, John Young, the founder and lead vocalist/keyboardist wrote all the songs with occasional help from the drummer/percussionist and backing vocalist Frosty Beedle, and on one song Steve Rispin, who did the engineering, mixing, and sound designing. There is an interesting story about the title ‘Cardington’ on the band webpage (link is given at top of this review) you may want to read. The physical CD comes with a nice booklet and the packaging is a glossy cover fold out digi pack for the lovers of this format such as myself. This, the third full length release by Italian avant garde trio, is something to behold. Any fan of bands such as This Heat, Massacre (The Fred Frith band), Cassiber, and similar bands, along with the more aggressive King Crimson, David Torn, and Rec Records output (specifically the electric guitar fronted groups) , would surely find interest in ‘Compartment C’.